March will be a busy month with two major presentations. First will be at Canoecopia in Madison, Wisconsin on Saturday, March 9th at 4:30 PM. Then on March 23rd, as part of the Far North Symposium. The presentations have received great responses from canoeist and non-canoeist alike, be sure to stop by and say hi after wards. Also, copies of 2600 above 60 will be available for purchase at these events. In other news, expedition member Steve Keaveny will be married in Heber, Utah on March 16, 2013. Congratulations to Steve and the very lucky Amanda Kays. And the final bit of news is that the documentary, 2600 above 60, is in the final production stage and almost ready to be shipped out. You can preorder your copy by following this link. I have thrown my hat into the ring! In hopes of wining the IMAX Award, an award designed for filmmakers interested in exploring the theme of exploration, I am proud to present this trailer. Please join or login to Vimeo and "like" the video, as your support will certainly help. Pete Marshall will be a featured speaker at Midwest Mountaineering's annual Fall Outdoor Adventure Expo. 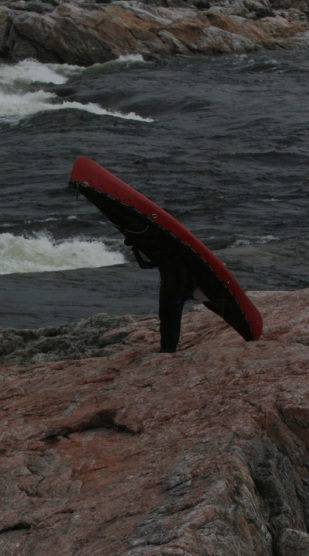 If you are in the Twin Cites, or in Minnesota, or in the USA or even Canada, you'll want to make your way the the UMN campus and enjoy photos, films and stories from the 2012 Trans-Territorial Canoe Expedition. Click Here for more info. The four of us were incredibly lucky to have been able to experience our adventure, and believe that it is necessary to give back, to pay it forward, to be considerate of others and to be part of something that is bigger than yourself. And that's why we are proud to be a part of the First Descents program. First Descents is a nonprofit adventure based program that takes young adult cancer survivors and fighters on excursions, climbing, paddling, and surfing, free of charge. If we rally together to support First Descents, we support others discovering the lessons, thrills, and personal growth nature and adventure have to offer. Our goal is to raise $2,600 for the 2600 miles we paddled. For each $1000 raised we are able to share the experience and peace that nature can bring with one person. Click here to find out how to give! One of the largest expanses of untouched wildernesses left on earth, Canada has lured adventurous souls for centuries, and for centuries people have explored this land from a canoe. Yet the magnificent rivers and untracked wilderness are under continual threat of development and degradation. Conceived out of a love of adventure and a sense of responsibility for preserving our wilderness heritage, the mission of the Trans-Territorial Canoe Expedition is to combine outdoor recreation with wilderness conservation. This path-breaking journey is both a celebration of the ever-shrinking back country, and a challenge to fellow outdoor enthusiasts to reevaluate their role in broader environmental issues at home and abroad. It is an urgent plea to reconsider our relationship with the wilderness. 2) Contribute to the broader paddling community by expanding upon traditional routes and blazing a new path through the territories. We plan to spread our message of stewardship through various forms of media: magazine articles, presentations, this website, a film, and a book. In this way we plan to share the immense wonder that is the natural world with a wider audience, and show why we need to preserve places like Canada's Territories for future generations.